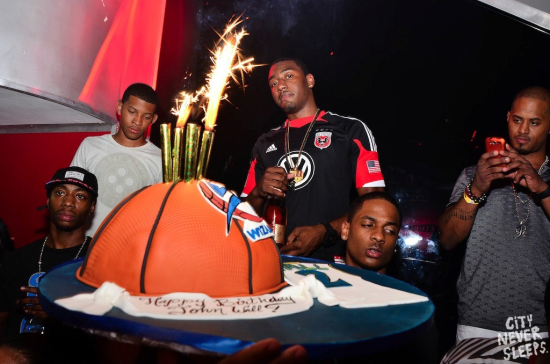 A few weeks ago it was John Wall's birthday. He spent the week partying at clubs like any Wizard young man would do. This one particular club in Miami, Play, featured a stripper pole and booty booty booty booty rockin' everywhere. Wall tweeted pics back when the party happened, but I guess DC United just found out (10 days later) that he was wearing a jersey. Looks like fun. Looks like a nice cake. But do you notice anything wrong with the picture? That's right, the cake is with the old wizards colors, and has an old wizards jersey on the right side. I wonder if Wall even noticed? I can understand on why they look unhappy. With the current Wizards losing, the Redskins are flying with RG3. Based on cupcake courses, the right logo for the right team.